This entry was posted on July 6, 2017 by Maarja Korv. In tech Machine Learning (ML) and Artificial Intelligence (AI) have been buzzworthy for a couple of years, but the concept is gaining familiarity and arousing curiosity beyond the uber-tech scene fast. And well with reason. Artificial Intelligence is the broader concept of machines being able to carry out tasks in a way that we would consider “smart”. And, Machine Learning is a current application of AI based around the idea that we should just be able to give machines access to data and let them learn for themselves. Artificial Intelligence and Machine Learning might currently be buzzwords, but both concepts are not even close to new. First mentions of artificial intelligence go way back. Its earlier roots can be found in the Greek myths of Talos, the mechanical man, designed to mimic our behaviour. And, Machine Learning as a term was first coined way back in 1959 by Arthur Samuel. You might or might not have known that Machine Learning already impacts you daily, almost everywhere. You’ve most certainly seen concepts of it play out on Amazon with its’ personalised product suggestions. And Facebook with its facial recognition software for tagging people in photos. On a side-note, another novel idea you’ll see play out on Amazon is it’s “Dash” button, which is made possible through the application of a concept called the Internet of Things (IoT). Implementing Machine Learning techniques for your e-store is a relatively new possibility. However, it’s still been readily available to store owners big or small for a good couple of years. Any reputable, known online store would never consider stepping back from the benefits of ML. It’s a magic bullet taking guess work out of boundless of marketing activities. Imagine your store morphing into somewhat of a crystal ball. Other than the initial setup you’ll start enjoying increased sales as soon as enough data is gathered to put its algorithms to use. Of course, you'll need to spend time on some fine-tuning and maintenance, and you’ll probably want to add more features in time. But depending on your market and products your revenue can go up anywhere from 5-20%. Implementing its techniques is like hiring a sales rep. Only that this sales rep is silent, completely invisible going discreetly unnoticed. What’s more, this sales rep is not only always polite but saves your customers time. They’ll be appreciative to find desired products quicker through personalised search results and recommendation blocks across the site. And as with the nudge from an in-person sales rep, customers are sure to make additional purchases. Plus, retention rates are higher. Some 50-60% of Amazon’s page elements are comprised of products and ad’s put together by Machine Learning algorithms that produce personalised product recommendations. These blocks have become a natural part of the site, and add tremendous value. For our clients, we'd most commonly suggest Nosto, a personalised suggestion engine. You can use it for cross sells, up sells and related product blocks. Depending on the features you’d like to start off with, the setup can take just 2-3 hours. As a bonus, It saves you plenty of time with catalogue management and admin work. Otherwise, you'd have to associate all product suggestions with SKU’s manually. And more often than not just based on your best guess. 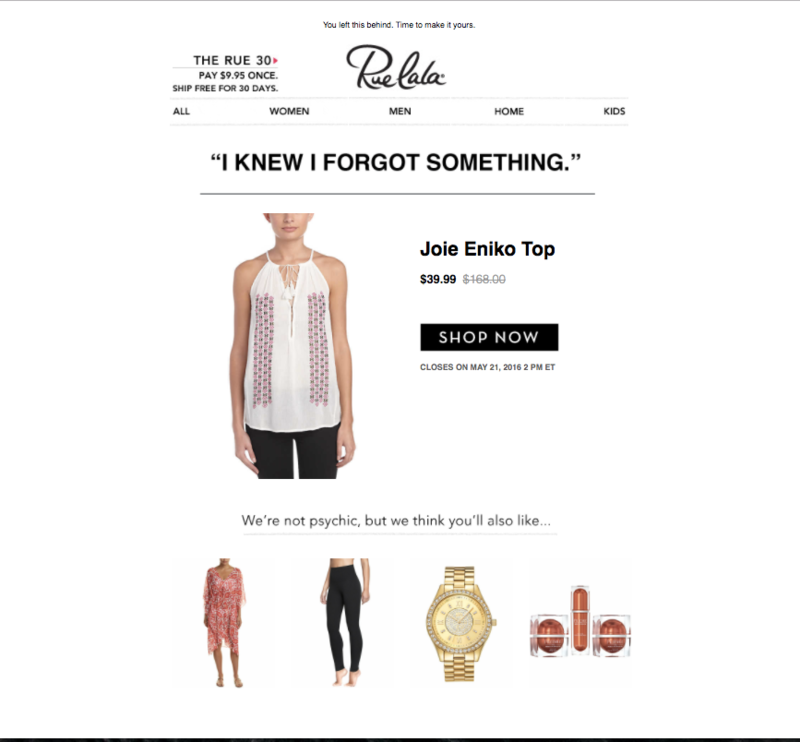 Example: Here's RueLaLa's crystal ball moment of personalised product suggestions and abandoned cart emails with a whimsical approach. Their big and bold "I knew I forgot something" captures attention immediately and creates urgency. And the "We're not psychic, but we think you'll also like" adds some playfulness. By implementing abandoned cart recovery emails, it’s possible to increase your sales even further. The very same products your customer had in their abandoned cart will be served back to them in their inbox, which is another “crystal ball” kind of a moment. These emails can also include the same personalised product suggestions as on-site recommendation blocks. The personalised product recommendations can be taken even further, reaching customers beyond your site and their inbox. And across multiple devices. As with on-site shopping suggestions and email re-marketing you’ll be able to target visitors personally based on products they’ve viewed. Plus you’ll be able to attract new customers based on lookalike demographics. Big retailers have millions of product listings. Take for example eBay, with its more than 800 million products. When you land on a site and start searching for a product filtering might fail you, as there are still too many options to browse through. If your product catalogue is that big, Machine Learning becomes invaluable. ML will rank search results taking into account your gender, age and purchase history, etc. With its help search results will be personalised, not just matches for phrases you’ve used. Plus it packs a similar power to Google making real-time suggestions while you’re typing. Airlines were the first to embraced dynamic pricing, take for example Ryanair. Prices change multiple times a day, so if you don’t make a booking on your first visit, you’ll probably encounter new prices once you’re back on the site. The price fluctuation may mean a win or loss, depending what’s supply and demand. How does ML work in the background? So now that we’ve covered possible use cases, we’ll shortly look under the hood, how personalization and predictions actually take place. Machine Learning is a concept by which computer algorithms solve problems by being exposed to them countless of times over with the aim to come to a solution. A computer program is said to learn from experience E with respect to some class of tasks T and performance measure P if its performance at tasks in T, as measured by P, improves with experience E.
Or in other words, a computer program can improve its performance of a task based on past experience. If you’re somewhat familiar with the workings of Google Search, then you know you’re served results based on infinitely complex algorithms. These take into account your location, language, previous search history and many other parameters. In its core nature, Machine Learning is similar. It runs on predictive API’s that are intelligent and self-learning. Supervised learning means the desired outcome is already clear and sample data is labelled with the correct answer. The algorithm is then “trained” and when fed new data, ML gives results based on past experience. Unsupervised learning means the algorithm is not given pre-labelled data with the correct answers. For example, if ML is given to analyse a language over time the algorithm starts detecting patterns by. Reinforcement learning resembles unsupervised learning. No labelled data is provided but results are graded after analysis, which reinforces desired outcomes. If you’d like to dig deeper, then here’s a great video that explains the workings of ML in greater detail: What is machine learning? Why wait while you lose revenue? 60% of our clients already have Machine Learning algorithms running on their sites. With the first project way back in 2014. Contact us for a quote or if you’d like to know more about ML and it’s techniques. And what we can do for you to boost your sales.